A paramilitary police officer stands outside the media center of BRICS (Brazil, Russia, India, China and South Africa) Summit in Xiamen, China September 2, 2017. XIAMEN, China - A meeting of the BRICS group of emerging economies is expected to rally against trade protectionism, China’s vice trade minister said on Sunday, the first day of the summit in southeastern China. The heads of state from Brazil, Russia, India, China and South Africa will gather in the city of Xiamen through Tuesday, giving China as host its latest chance to position itself as a bulwark of globalization in the face of U.S. President Donald Trump’s “America First” agenda. 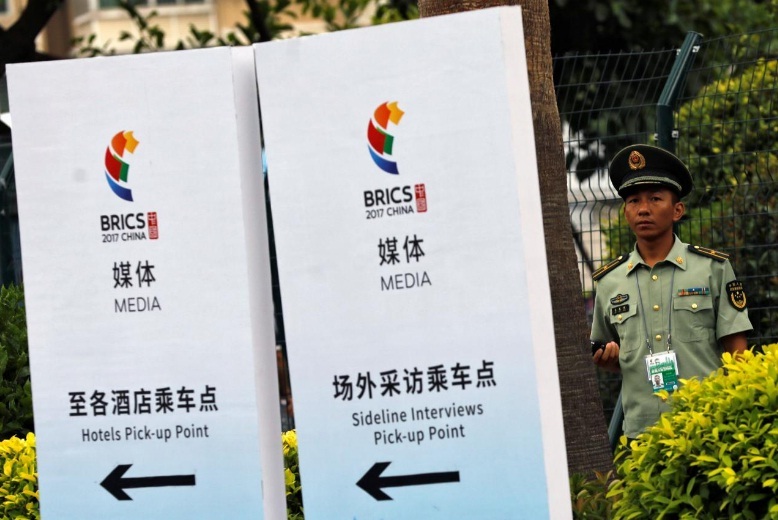 BRICS leaders will be joined by observer countries Thailand, Mexico, Egypt, Guinea and Tajikistan, and officials will discuss a “BRICS Plus” plan to possibly expand the bloc to new members. Among the observers, Mexico’s President Enrique Pena Nieto is set to be in China to discuss trade and investment, as Trump has renewed threats to scrap the 23-year-old North American Free Trade Agreement (NAFTA) that he has labeled a killer of U.S. jobs. “We expect to reach consensus for actions in support of the multilateral trade system and oppose trade protectionism,” Vice Commerce Minister Wang Shouwen told a briefing ahead of the opening ceremony for a BRICS business meeting, where Chinese President Xi Jinping will speak. Wang did not elaborate on those actions, but said China was interested in possibly establishing a free trade agreement with Mexico. In July, Xi called on members of the Group of 20 (G20) nations to champion an open world economy, and as a keynote speaker at the World Economic Forum in Davos, Switzerland, in January offered a vigorous defense of globalization. But those remarks are cold comfort to some critics of China, foreign business groups and governments alike, who say China has done little to remove its own discriminatory policies and market barriers that favor Chinese companies. The BRICS summit comes just a week after China and India agreed to end a more than two-month standoff between hundreds of troops in a Himalayan border area, which had put a sidelines meeting between Xi and Indian Prime Minister Narendra Modi in question. The standoff was the latest example how BRICS countries, while sharing certain development goals, are far from unified. Some have questioned the relevance of BRICS and China’s commitment to its New Development Bank (NDB) in light of Xi’s own global Belt and Road development initiative and the China-led Asian Infrastructure Investment Bank. Set up in 20l5 as an alternative to the World Bank, the Shanghai-headquartered NDB was seen as the first major BRICS achievement after the group came together in 2009 to press for a bigger say in the post-World War Two financial order created by Western powers. The bank aims to address a massive infrastructure funding gap in the member countries, which account for almost half the world’s population and about one-fifth of global economic output. China’s vice finance minister said in a separate briefing that BRICS countries had agreed to launch a fund to support future NDB projects, but gave no details. The NDB’s president on Friday said it aims to make about $4 billion in loans next year. To date, it has invested in 11 projects, lending $1.5 billion in 2016 and $2.5 billion in loans set for this year.